In “Analyzing the Role of Citizen Science in Modern Research”, Luigi Ceccaroni and Jaume Piera argue that we are living at the dawn of a dramatic change in science. This change is being driven by powerful new cognitive tools, enabled by the internet, which are greatly accelerating scientific research. There are many books about how the internet is changing business or the workplace or the government. This is the first book about something different and fundamental: how the internet is empowering citizens in transforming the nature of science. The following chapters underline the fact that citizen science is now a significant international phenomenon. No longer simply a broad concept, but instead firmly taking shape in a range of specific actions, citizen science has emerged on a scale that few could have anticipated. As the contributors to this book discuss, professional and practitioner organizations have sprung up across the globe, tens – even hundreds – of thousands of participants are engaging in citizen science world-wide, and thousands of citizen science projects have been developed. And, just in case there should still be any doubt about the emergence of citizen science, even the Oxford English Dictionary has found it a place. In chapter 1, the authors begin by proposing a slight re-framing of citizen science, which will contextualize the information presented in the rest of the book. The authors propose a perspective on and a definition for citizen science (which is alternative to the numerous previously documented definitions) as: “work undertaken by civic educators together with the general public to advance science, foster a broad scientific mentality or encourage democratic engagement in local concerns, which allows society to deal rationally with complex modern problems”. By explaining the rationale behind this definition, the authors also hope to raise awareness of the role that the meaning of words and phrases (semantics) plays in understanding and supporting citizen science. This chapter also explains how different organizations already use certain software solutions to organize knowledge about citizen science, how these systems can be classified and how they can facilitate or impede interoperability – the ability of machines to pass information between each other. In chapter 2, the authors show how, with recent advances in technology, citizen-science activity is growing rapidly around the world and diversifies into new disciplines. This expansion is accompanied by the formation of associations and networks dedicated to citizen-science practitioners, which aim to support citizen science as a research approach. This chapter examines how four such organizations in the United States, Europe, Australia, and China have begun to take shape, and are working with citizen-science communities and stakeholders in their respective regions and globally. Challenges and future plans of these groups are also discussed. This chapter identifies three core roles of citizen-science practitioner organization: (1) establishing communities of practitioners; (2) building expertise through the sharing of existing knowledge and the development of new knowledge; and (3) representing community interests. The authors aim then to stimulate further research, discussion and critical reflection on these associations and networks in the emerging citizen-science landscape. In chapter 3, the authors focus on how SciStarter has developed a new digital infrastructure to support sustained engagement in citizen science, and research into the behaviors and motivations of participants. The new digital infrastructure of SciStarter includes integrated registration and contribution tracking tools to make it easier to participate in multiple projects, enhanced GIS information to promote locally relevant projects, an online personal dashboard to keep track of contributions, and the use of these tools (integrated registration, GIS, dashboard) by project owners and researchers to better understand and respond to the needs and interests of citizen-science participants. In this chapter, the authors explore how these new tools build pathways to participatory policymaking, expand access to informal STEM experiences, and lower barriers to citizen science. The chapter concludes with a design for a citizen-science future with increased access to tools, trackable participation, and integrated competencies. In chapter 4, the authors show that in order for citizen-science initiatives to pan out well, various actors need to be willing to engage in citizen-science activities. The authors’ particular interest lies with the citizens and their motivations to participate in technology-enabled citizen science since without citizen participation there is no citizen-science activity. The authors examine in detail a particular case: citizens’ willingness to collect weather-related data using personal weather stations and share them via online amateur weather networks. To better understand what determines citizens’ interest to participate in such online networks and how their activities could be up-scaled to address hydro-meteorological data gaps, the authors use the lens of a decision-making theory to guide their empirical research. Chapter 5 focuses on the risk that, when introduced in social environments different from those in the Global North where it originated, citizen science may be subject to the error of providing the right answer to the wrong question. To avoid this type of errors, it is necessary to train those who participate in citizen-science studies: citizens as well as researchers. Otherwise, we may encounter new forms of scientific dependence that benefit knowledge accumulation and policy decision-making in the Global North, without contributing to the quality of life of those who carry out the studies. This chapter analyzes the relationship between civic development, citizen science and ways of implementing research conclusions through public policies, given the characteristics of political and citizen participation in the Global South. Here, the introduction of citizen science is seen as an opportunity to construct a more inclusive and participatory society, and to reduce the risk of returning to paternalistic, passivity-inducing and purely instrumental approaches to development. Chapter 6 shows how citizen-science initiatives have been known to exist for a long time, but only recently they were further enhanced thanks to technological and societal developments, such as the availability of mobile devices, the widespread use of the internet and the low cost of location devices. These developments shaped the geographic information system (GIS) world as it is known today: a group of technologies that allows retrieving, storing, analyzing and sharing spatial information, by people who are not necessarily GIS professionals. This chapter starts with a general background about GIS, adding then more detail in topics of particular relevance in the context of citizen science. The rest of the chapter is focused on reviewing and classifying the use of GIS in citizen-science initiatives; and some use cases are described in order to provide practical examples of the use of these technologies for solving specific spatial problems. The chapter closes with a brief discussion of the future of GIS in citizen science, in the light of current technological trends. Chapter 7 aims to analyze the role of citizen science in sustainable development, including case studies implementation, with specific focus on the suitability of citizen science in environmental sustainability. The authors present solutions and recommendations for designing and executing citizen-science initiatives, and thoughts on the future role of citizen science. Firstly, the authors review the state of citizen science in sustainable development and explore the potential of citizen science for environmental research and governance. Secondly, the authors identify and elaborate on the core components that support the role of citizen science. Thirdly, using several citizens’ observatories studies from various regions in Europe and within diverse environmental fields, the authors highlight the lessons learned, and reflect on major outcomes, challenges and opportunities. Chapter 8 provides a brief history of citizen science in our societies, identifies the main stakeholders involved in projects of this topic, and analyzes the main points to take into consideration, from a social perspective, when designing a citizen-science project: communicating; recruiting and motivating participants; fostering innovation, interdisciplinarity and group dynamics; promoting cultural changes, healthy habits, inclusion, awareness and education; and guiding policy goals and decisions. Different governance structures, and a coexistence of different approaches, are analyzed together with how they suit different communities and scientific studies. Chapter 9 focuses particular attention on learning dynamics that are common to citizen observatories, the technology-driven environments where a diverse range of tools is developed, such as web portals, smartphone apps, monitoring devices, and allows the growth of citizen-science projects, particularly those with the principal objective of a large-scale participation of people, covering large geographical areas and long periods of time. These observatories integrate the latest information and communication technologies (ICT) to digitally connect the citizens, improve their observational capabilities and provide information flows. The concept of citizen observatories offers great possibilities as an educational experience, precisely due to the opportunities offered by the participation of citizens, with different levels and roles, in terms of active collaboration, and in shared processes of knowledge creation. This is especially clear when we pay attention to the complexity of the challenges education must face today, within the framework of a society of knowledge. Chapter 10 focuses on the role of citizen science in environmental education. Citizen science is increasing in popularity and is used by academics, communities and a wide range of non-governmental organizations. Many within the field of environmental education see the convergence of citizen science, science education and environmental education as a major opportunity for enhancing sustainable thinking and behaviors. Through synthesizing existing literature, policy documents and educational materials, this chapter critically reflects upon the pedagogic potential of the convergence of citizen science and environmental education. It also challenges the notion that environmentally concerned citizen-science projects enhance awareness of ecological issues and encourage the adoption of more sustainable behaviors. The author draws upon insights from practical projects to explore the motivations and experiences of citizen scientists; and discusses the apparent impacts of involvement in citizen science upon the individual in the development of environmental citizenship. Chapter 11 shows how global environmental changes put society in front of new challenges, and how immediate and intense actions have to be undertaken in order to foster necessary progress in global sustainability research. The technological infrastructure has reached a status of ubiquitous computing and virtually unlimited data availability. Yet, the dynamic nature of the global environment makes continuous and in-situ monitoring challenging. Citizen-driven geographic information science can bridge this gap by building on inputs, observations, and the wisdom of the crowd, represented by the citizens themselves. This chapter argues for the important role of citizen science in geographic information science, presents its position in current research, and discusses future potential research streams, based on the participation by and collaboration with citizens. In particular, the chapter sheds light on three major pillars of the future of citizen-driven geographic information science, namely: big geo-data; education; and open science. Chapter 12 considers the potential for citizen science to contribute to policy development. A background to evidence-based policy making is given, and the requirement for data to be robust, reliable and, increasingly, cost-effective is noted. The potential for the use of ‘co-design’ strategies with stakeholders, to add value to their engagement as well as provide more meaningful data that can contribute to policy development, is presented and discussed. Barriers to uptake can be institutional and the quality of data used in evidence-based policy making will always need to be fully assured. Data must be appropriate to the decision making process at hand and there is potential for citizen science to fill important, existing data-gaps. Chapter 13 focuses on how, by “activating” the citizen’s engagement in the research process, the scientific community has a smart way to benefit from the wisdom of the “crowd”. There are countless success stories in which citizens participate, contributing with their knowledge, cognitive capacity, creativity, opinion, and skills. However, for many scientists, the lack of familiarity with the particular nature of citizen participation, which is usually anonymous and volatile, turns into a barrier for its adoption. This chapter presents a problem-based typology for citizen-science projects that aims to help scientists to choose the best strategy for engaging and counting on citizen participation based on the scientific problem at hand; and some examples are included. Moreover, the chapter discusses the main challenges for researchers who intend to start involving the citizens in order to solve their specific scientific needs. Chapter 14’s starting premise is that for decades the United States Environmental Protection Agency region subsuming most of the Great Lakes watershed has been partially monitored by private citizens, but collected data have been underutilized by water managers, scientists, and policymakers. Today, citizens with only a smartphone can dramatically increase our understanding of surface water, help managers and policymakers, and educate the general public about the quality of water. The US Clean Water Act and National Strategy for Civil Earth Observations have helped to coordinate citizen scientists and direct funds to surface-water monitoring. And more contributors are being solicited and trained to help with the enormous task of monitoring lakes and streams. At the same time, technology allows citizens with a smartphone to accomplish what previously required experts in a lab: to act for clean water! Ceccaroni, Luigi, Anne Bowser, and Peter Brenton. “Civic Education and Citizen Science: Definitions, Categories, Knowledge Representation.” Analyzing the Role of Citizen Science in Modern Research. IGI Global, 2017. 1-23. Ceccaroni, L., Bowser, A., & Brenton, P. (2017). Civic Education and Citizen Science: Definitions, Categories, Knowledge Representation. 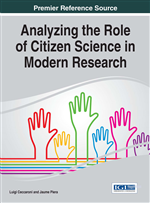 In Analyzing the Role of Citizen Science in Modern Research (pp. 1-23). IGI Global. Ceccaroni, Luigi, Anne Bowser, and Peter Brenton. “Civic Education and Citizen Science: Definitions, Categories, Knowledge Representation.” In Analyzing the Role of Citizen Science in Modern Research, pp. 1-23. IGI Global, 2017. Ceccaroni, L., Bowser, A. and Brenton, P., 2017. Civic Education and Citizen Science: Definitions, Categories, Knowledge Representation. In Analyzing the Role of Citizen Science in Modern Research (pp. 1-23). IGI Global. Ceccaroni L, Bowser A, Brenton P. Civic Education and Citizen Science: Definitions, Categories, Knowledge Representation. In Analyzing the Role of Citizen Science in Modern Research 2017 (pp. 1-23). IGI Global. The goal of this book is to help educators and researchers to increase the value of the information they deliver to others and to open up opportunities for others to learn and engage in the domain of citizen science. Some of the chapters of the book explain how to teach people about a scientific subject in ways that make what is learned more likely to influence subsequent decisions which involves citizens. In other chapters, the authors show that relatively simple principles can help educators and researchers to deliver the kinds of information that make desired learning and engaging outcomes, often in terms of citizen activities, more likely. Typical activities included in citizen science range from data collection and analysis to information access and delivery. It is then important to define data, information, and also the related concepts of knowledge and competence; and their relationships to one another. Understanding their differences is a key to increasing knowledge and competence. Data are collected and analyzed to create information suitable for making decisions, while knowledge is derived from extensive amounts of experience dealing with information on a subject. Information is what educators and researchers can convey to others directly. The same is not true for knowledge or competence. Knowledge is memories of how concepts and objects are related to one another. Knowledge requires information. Conveying information is the means by which educators and researchers can increase others’ knowledge. Competence is the ability to perform a task in a particular way. A competent choice is one that is consistent with a relevant set of facts (say, about water quality) and that is in sufficient alignment with a chosen criterion (e.g., how one feels about tradeoffs between environmental sustainability and economic growth). Competence is always with respect to a task and an evaluative criterion. and requires knowledge. Educators’ and researchers’ information can increase citizens’ competence only if the citizens think about the information in ways that transform it into applicable types of knowledge. Educators and researchers can achieve their objectives more effectively and efficiently by understanding what kinds of information are more relevant to increasing specific competences. when your tweets are mined, you are not conscious of your participation in citizen-science projects. Often, data collection means citizens using lightweight and accessible sensor technologies to gather, and then share, data in order to collectively monitor the environment. Data-collection technologies range from specific sensors or applications that augment mobile phones to increase their functionality, to dedicated, smart and connected devices. Although there has been and there is a vast number of citizen-sensing projects (e.g., instigated by civic educators), modern, large-scale research, in which citizen science has a role, demands new applications (software solutions or systems), and better integration within and among different organizations collecting and using scientific information. An important aspect in citizen-science data analysis, processing and interpretation is quality control. The data are coming from various sources and are collected under different conditions, which influence the quality of the observations and their use. For wider use it is required to validate the observations by means of data quality-control procedures including giving quality flags as is normal practice in data management. Part of the quality control is also related to the fact that people provide (in a more or less voluntary, active or conscious way) sufficient metadata and context data, such as time, location, name, instrument, when uploading their observations to project databases. This meta-documentation provides essential information next to the data themselves. Sensing technologies can sometimes automatically provide contextual information, which is an essential requirement for personalization and for real-time data-quality validation. Mobile applications can check in real time if a measurement is taken correctly (taking into account, for example, position, orientation and temperature). Another aspect to take into account in quality control is the potential knowledge transfer among participants. Participants with more expertise may help in validating or providing additional information on observations reported by new users. For a citizen-centered project to bring about benefits to society a critical aspect is information access. For example, by sharing information about environmental factors, citizens can become aware of how their lifestyles affect the ecosystem, identify local issues such as air pollution, and learn more and act on their environment. However, there are challenges associated to information delivery and information access. It is important to focus on how to deliver information more effectively. The starting premise is that a person’s ability to pay attention to information is extremely limited. Unchangeable aspects of human biology lead people to ignore almost all of the information to which they are, or could be, exposed. Since learning and engaging require attention, educators and researchers who want to increase citizens’ knowledge or competence have to find ways to get their attention. A common requirement for obtaining attention is citizens perceiving information as being highly relevant to their immediate needs. The ineffectiveness of many educational and engagement strategies can be linked to mistaken beliefs about how citizens perceive the value of different kinds of information. Citizens often perceive as abstract or uncertain the benefits of learning and engaging about many of the things about which educators and researchers are. Educators and researchers who fail to recognize these perceptions tend to overwhelm citizens with information that they do not want and will not use. With the goal of helping educators and researchers in mind, it is important to recognize that many educators and researchers channel their energies into ineffective strategies that do little for the improvement of the knowledge, or the increase of the competences, that motivated them to develop educational or research strategies in the first place. Educational and research ineffectiveness occur because many educators and researchers are mistaken about how people learn and make decisions. Mistaken beliefs lead many educators and researchers to offer information that others do not value or cannot use. In the book, the authors examine relationships among the information to which people are exposed, the knowledge that such information produces, and knowledge’s effect on important competences. The book’s central proposition is that educators and researchers can be much more effective if they know more about how people think and learn about science, about ways to differentiate between information to which prospective learners and citizens in general will pay attention and information that these same people will ignore. It is important to focus particular attention on learning dynamics that are common to citizen science; and offer ways for educators and researchers to increase the value and effectiveness of their educational and engagement strategies. It is important to show educators and researchers how to develop more effective ways of increasing useful kinds of knowledge in a wide range of citizen-science contexts, and relative to three components: issue complexity, stakeholder roles and learning/engaging costs. By complexity, we mean that the domain of citizen science has diverse and occasionally contradictory components, experienced by an equally diverse range of communities; and, when a domain is complex, educators and researchers have to choose how to frame it (i.e., they have to choose how to formally represent it and what parts of the topic to emphasize). Choices about how to frame issues in citizen science will impact the effectiveness of the communication and exchange of information, and determine whether or not that information has any subsequent effect on others’ knowledge and competence. In this respect, we offer a vision in which, even if citizen science moves towards more and more formal knowledge-representation and the ability to carry out automatic reasoning by machines, humans are responsible for checking whether any given knowledge representation is still an accurate reflection of reality. If we focus on stakeholder roles, we can find a variety of situations to be taken into account. A member of the board of directors has different roles than do individual members of an association. Legislators have different roles than citizens who hold no elective offices. These role differences mean that information that increases a policy maker’s competence at his most important tasks may have little value to people with different roles (say, a member of a school board), and vice versa. Understanding stakeholder roles can help educators and researchers to direct information to more valuable ends. If we focus on learning and engaging costs, it is important to note that increasing knowledge or competence can take a lot of work. Educators and researchers have to put effort into developing and implementing their strategies. Citizens have to devote resources to learning and engaging. Everyone involved in educational and engagement efforts pays costs of one kind or another. For some, the costs are sacrificed time and effort. For others, money is the main expense. These costs alter the net benefit of different types of information to different kinds of people. Understanding different types of learning and engaging costs reveals an important implication for educators and researchers: even if people share important values and stakeholder roles, they may disagree about whether the costs of an educational or engagement effort are worth paying because some people face greater costs than others. Educators and researchers can use this kind of knowledge to elicit broader participation in important educational endeavors and to accomplish important educational and engagement goals more efficiently. If you’re concerned about access to this book, please read our notes on this matter here: [http://www.1000001labs.org/analyzing-the-role-of-citizen-science-in-modern-research-book-criticism/]. Citizen science draws from different fields, such as environmental sciences, biological sciences, Earth observation, crowdsourcing, do-it-yourself approaches, participatory science, environmental mapping, intelligent data-analysis, social sciences and artificial intelligence. Initiatives and projects based on citizen-science are being developed at local, national and global levels, and are reaching out to ordinary citizens and decision makers for them to engage and take part in science together with researchers. Prominent examples of citizen-science projects are the European citizens’ observatories [http://www.citizen-obs.eu/]. Citizens are now valued as a key component in the global transition towards a sustainable development, and citizen science aims to: enhance capacities with regard to citizens’ initiatives; collect and analyze data from citizens; identify good practices and challenges, such as data accessibility and interoperability; and deliver information to decision makers and, importantly, back to the citizens. Citizen science can support decision makers by intensifying the dialogue at different scales: from improving early-warning systems, to assisting grassroots activities to protect an endangered species, to supporting environment-related policy targets. It provides the methodology and tools to listen to and engage with citizens on issues such as environmental sustainability, and thus acquire essential local knowledge to determine if national and international environmental programs are working. allow greater cooperation among citizen-science initiatives. data harmonization, describing how citizen science can be integrated with existing standards. Based on the analysis of existing experiences, it defines best practices in the methodologies to set up and implement citizen-science initiatives, especially at the international level. Citizen science will be formally defined through the description of its relation with the following areas of knowledge: Earth observation, environment quality, education, socioeconomic benefits, information acquisition, information processing and interpretation, information delivery, data interoperability, standards, novel low-cost technology, collaboration and teamwork, security, and privacy. This book aims to be an essential reference source about how novel, low-cost technology might be used in citizen science, providing landmarks and guidelines to decision makers and researchers exploring this new territory in knowledge and working at the cutting edge of this field. It will provide inspiration to researchers who designed a tool with one specific use in mind, to generalize it to other uses and to realize the social innovation potential when this tool is used in citizen observatories. The book will help to relax the constraints of governing metaphors in science. Society is failing to see the citizen-science revolution coming, in part because science’s governing metaphor is drawn from the idea of the scientific document in highly specialized journals: expensive materials and methods, not people. Consequently, most science is not considering low-cost instruments, alternative ways of publishing and social networks. Even if citizen science is not a plug-and-play solution to sustainability, this book will help to perceive important developments and possibilities, such as that individuals are taking an active role in the transition to a sustainable society, and in helping to protect and improve health and the environment; and will do this not assuming that traditional trends will continue to follow their trajectory. Sciences, in the last century, have been characterized by their increasing complexity: an obvious and indisputable trend. Despite this fact, this book will document the rise of citizen science, whose simplicity, openness and ability to empower and engage citizens make it perfect for a society which is already been changed by Facebook and the iPhone. Finally, this book considers the risks of innovating our way out of strong dependency on traditional science only to be plunged into chaos when the world suddenly finds itself dealing with different approaches to science at the same time. Because every new solution often hides its own set of problems, one objective of this book is to define paths to conciliate and mutually strengthen traditional and citizen science. Academicians, researchers, policy makers, technology developers and government officials aiming at developing a citizen- or participatory-science initiative will find this text useful in furthering their exposure to pertinent topics and research efforts in this field. This book is anticipated to be released in November 2016.